Polyester Underpacking Foil – Nuenka S.L..
Non-adhesive polyester hanger for adaptation to cylinder circumference and length of printing on offset printers. Folabase U can be applied very easily under forms of printing and rubber blankets. In addition, the material can be used in varnishing units in combination with the Folacomp compressible blanket to achieve ideal lifting conditions. Composed of a layer of biaxially stretched polyester that offers a high dimensional stability. The thickness tolerance is low. The composition of the material has extremely high swelling resistance to wetting solutions and cleaning agents showing less tendency to breakage. Folabase Soft U offers a reliable support for the adaptation to the circumferences of cylinders and print lengths in offset printers and guarantees an optimal point transfer. The two-layer composite of dimensionally stable polyester and extremely ductile polyurethane ensures extremely high dimensional stability and a constant thickness. Unlike the sheets of calibrated paper, Folabase Soft U has a good breaking strength and can be used again. It is very resistant to the swelling caused by moisturizing solutions and cleaning agents. 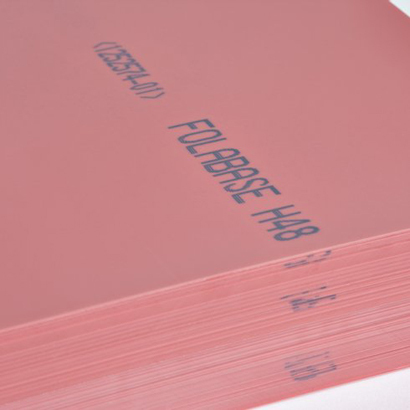 Folabase H 48 is a new Folex product in the segment of self-adhesive sheets. The corrosion inhibiting additives in our Folabase H48 polyester hanger protect the cylinder surface. The blade can easily be applied to the cylinders and can be removed quickly and cleanly with very little effort. The protective film is made of siliconized polypropylene, which prevents wrinkling and prevents dust penetration. Due to its high resistance to chemical cleaners and solvents, Folabase H48 is characterized by a long service life. The sheet shows very good thermal stability in the press. Folabase H 48-RB is a specific development of the Folabase H 48 hike. An anti-slip surface lining supports the special requirements of the underlying sheets on blanket cylinders. Folabase Soft A is the self-adhesive version of our modern and flexible Folabase Soft U. The composite of two layers of dimensionally stable polyester and extremely ductile polyurethane ensures extremely high dimensional stability and a stable thickness. The soft polyurethane layer absorbs mechanical forces and ensures good resistance against paper jam.